I knew Steve Innocente (the owner/brewer) in the late 90’s when we were both doing graduate school. I was on his ball hockey team, and although I don’t remember a lot of wins, I do remember going for a lot of beers. Since that time, Steve has done a post-doc studying Saccharomyces Cerevisiae (brewing yeast!) in Scotland, and then returned to open his own brewery. 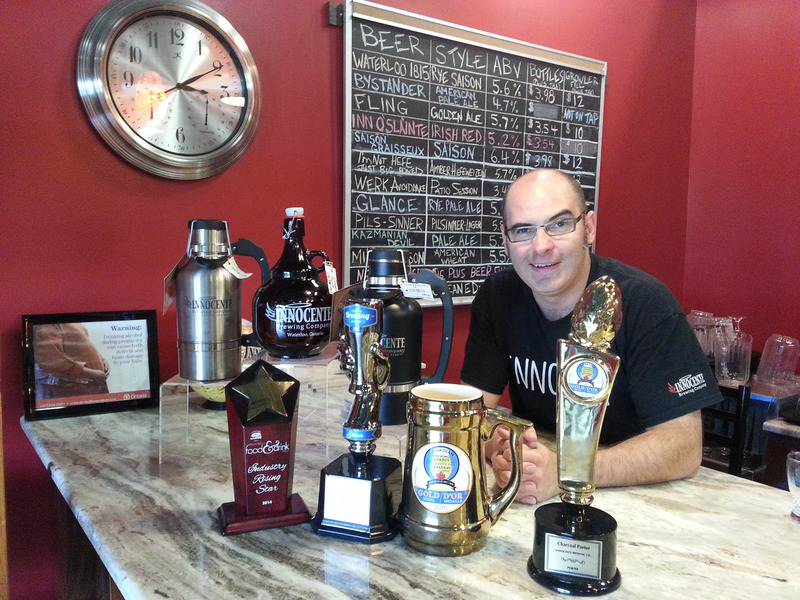 He recently won a gold medal at the Canadian Brewing Awards for his Charcoal Porter. That might lead you to think that he’s a malt man, or given his background you might expect some crazy yeast experiments, but his brews are generally hop-forward, bitter & dry. The brewery is located on the outskirts of Waterloo, near the RIM Technology Park and Conestoga Mall. 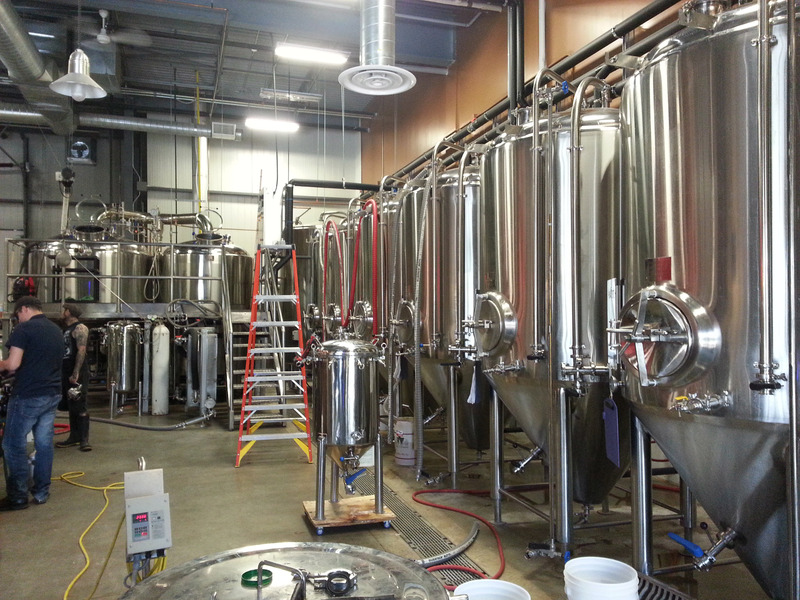 They have a ubiquitous 10 barrel brewing system, along with a number of 10 barrel conical fermenters. This small-batch brewing allows the production of a variety of brews, and is probably more similar to a large brew pub than a larger ‘micro’ brewery. They do have a single 20 barrel conical, which they’re currently using for their Pils-Sinner. And yes, this is a real Pilsner. They start with distilled water, which they adjust to match a water profile you’d find in Northern Germany. Then they use an actual lager yeast (not some speedy hybrid) and also provide the necessary time for it to properly condition. When I had it in June, they were using the old-school U.S. Cluster hops along with Wiamea from New Zealand. I see they’ve now swapped out the Cluster for Mt. Hood, but I suspect this is still an exceptional brew (and probably outside anyone’s expectation for a North American Lager). The other brew that really stood out for me was the Werk Avoidance. Don’t let the “Patio Session Ale” moniker fool you, this is FAR better than most India Session Ales. At only 3.4% abv, it combines Galaxy, Centennial and Palisade to pack some serious hop flavour. If Dogfish Head did a 30 minute IPA, this is the sort of thing I’d expect! Continuing the hop theme, there’s the Innocente Fling Golden ale (Challenger & Mt Hood hops), Kazmanian Devil Pale Ale (I’d never tried the Kazbek hop before), Mike Weisson American Wheat (Centennial & Cascade), Innocente Glance Rye Pale Ale (Cluster & Chinook), Innocente Bystander Pale Ale (Galaxy) and Innocente Conscience IPA (Chinook, Galaxy & Ella). There’s also the Inn O’Slainte Irish Red Ale that’s a little drier than most Red Ales, with some Challenger coming through in the flavour. Breaking from the hops, they have the I’m Not Hefe, Just Big Boned Hefeweizen with juicy bubblegum and underlying banana. Then there’s the Saison Graisseux which has a similar feel to Dupont (often a template for the style), but with a different yeast character and a Saaz hopping that’s readily apparent. While the Collaboration brew with Jordan St. John is also a saison, the Waterloo 1815 is entirely different. It’s lighter in alcohol, but has a little more depth to the malt flavour. Unfortunately none of the Innocente brews are currently available at the LCBO, but they do deliver to some of the finer beer-centric establishments within Ontario. 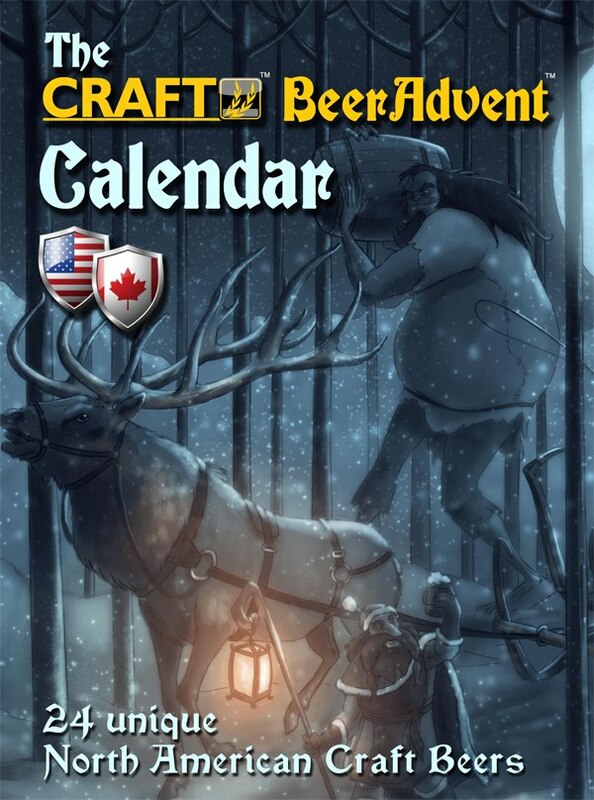 For the second year now I’ve acquired the Craft BeerAdvent (TM) Calendar. In 2012 it was an interesting mix of European brews. A few of them I had already had, but most of them had never been available here. The anticipation and surprise was really awesome, I felt like a kid again! Those 24 European brews currently have a Beer Advocate average of 3.5, but unfortunately a few of them weren’t quite fresh. For 2013, their selection was entirely from North America and the BA average increased to 3.6 (they averaged 3.2 on Rate Beer and 3.5 on Untappd). Freshness was occasionally still an issue and my personal score for these brews was 3.4. That said, I actually preferred the European mix simply because there was a wider variety of styles that aren’t readily available here. Now for 2013, December was even more interesting. 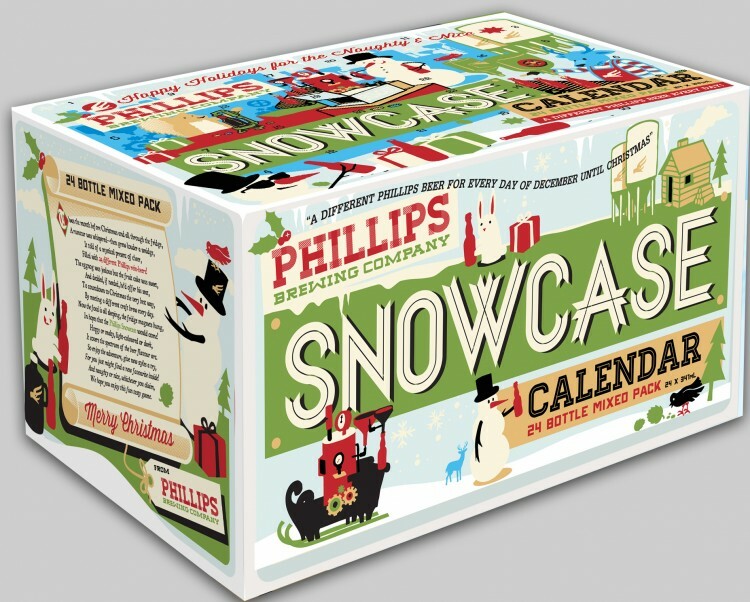 Phillips Brewing offered their own “Snowcase” Calendar filled with 24 unique brews. Naturally, I put them head-to-head (and kept notes in The Bar Towel forum). These brews averaged 3.8 on Beer Advocate, 3.2 on Rate Beer and 3.6 on Untappd. My personal score for the brews from this case was 3.7. So comparing the two, it was a wash for the Rate Beer users, Untappd put Phillips 0.1 ahead, BA put it 0.2 ahead, and I put it 0.3 ahead. Given the price point (~$135), I think the Craft(TM) guys could certainly select some better brews for us beer geeks. Perhaps they’re trying to appeal to the general population, but who’s buying these things? I know it was the beer geeks that snatched them up within a few hours in some locations. The Phillips Snowcase was clearly the better bang-for-the-buck (~$60), and I must say that I’m truly impressed that a single brewery can put together 24 brews of this caliber. There’s not many breweries that are capable of doing that, but it would be really great to see a few try. Perhaps someone could offer a “12 Beers of Christmas” (which would be an amazing gift to find under the tree), team up with another brewery, or perhaps the Ontario Craft Brewers could do a “Secret Discovery Pack”? I’m certain there would be a lot of interest. 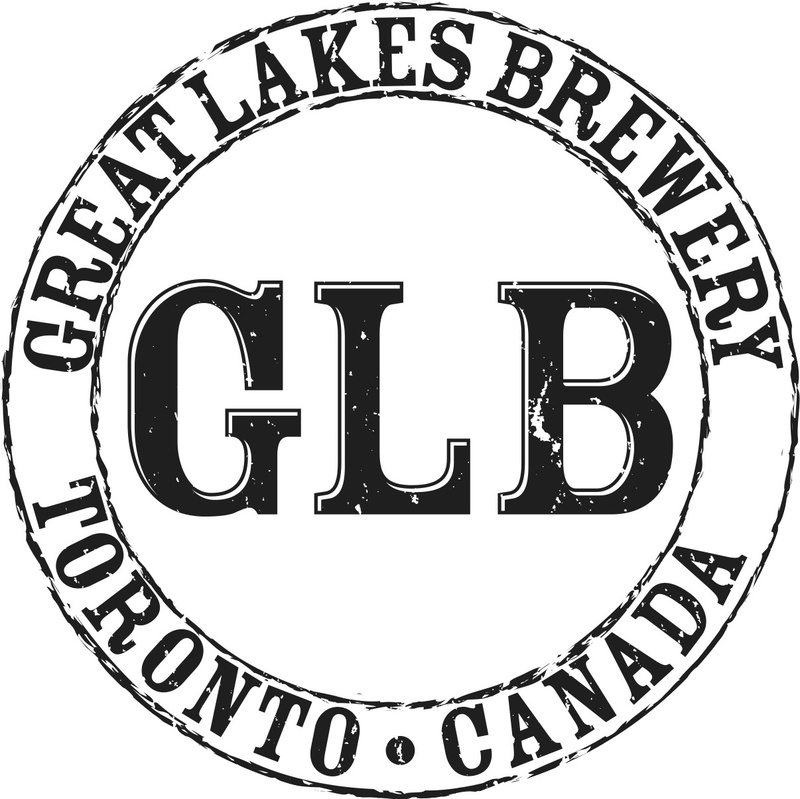 (Toronto, ON, April 24, 2013) – The Amsterdam Brewery and Great Lakes Brewery, two of Toronto’s oldest independently owned and operated craft breweries, are set to release their award winning collaboration beer – “Maverick & Gose” in the LCBO later this month. Maverick & Gose is a Leipziger Gose Beer that has been aged in Ontario Chardonnay barrels for 4 months prior to packaging. A rare German brew of medieval origin, this 2012 Canadian Brewing Awards Silver Medalist beer is brewed with a mostly malted wheat base, pink Himalayan salt, and spices. Notes of lemon, herbs and a slight saltiness make this collaboration truly unique to Ontario. What is even more unique about this beer is that it is the first all-Ontario collaboration to be released in the LCBO. Brewers Iain Mcoustra of Amsterdam and Mike Lackey of Great Lakes first developed the recipe for Maverick & Gose in early 2012. Maverick & Gose is available for sale in 500mL bottles from select LCBOs starting April 29, 2013 ($6.95) and the Amsterdam Brewery Retail Store (45 Esandar Dr., 416-504-6882). The Amsterdam Brewery is an independently owned and operated craft brewery that is deeply rooted in the city of Toronto. A pioneer of the craft beer revolution in 1986 and initially called the Amsterdam Brasserie and Brew Pub, The Amsterdam was the first of its kind in Toronto to offer patrons hand crafted lagers and ales that were brewed ‘in-house’. Today they brew over ten different beers including their flagship lager – Amsterdam Natural Blonde, the award winning Big Wheel Deluxe Amber, Boneshaker IPA and multiple year-round and seasonal brews. The Amsterdam Brewing Company uses only traditional brewing methods and their beers are made with four all natural ingredients – malt, hops, yeast, and water. All beers are GMO-free, without preservatives, and never heat pasteurized. 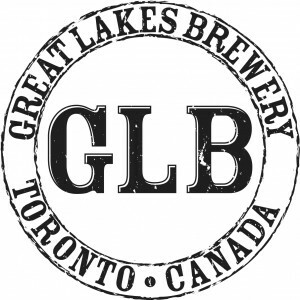 A fiercely independent owned and operated brewery, Great Lakes recently celebrated 25 years in the craft beer business, making them one of the oldest craft breweries in Ontario. Great Lakes specializes in producing flavourful beers that will be sure to tickle your taste buds with each sip. From unique seasonal ales and premium lagers to our Project X and Tank Ten Series beers, we produce a variety of products to be enjoyed by everyone! Based in Etobicoke, we invite you to visit our brewery for a taste of our award winning beers, including the Canadian Brewing Awards double Gold Medal Winner Crazy Canuck Pale Ale! To learn more about Great Lakes, visit www.greatlakesbeer.com. We love social media, so join in on the conversation! As our forefathers always knew, the moustache is the mark of a man. Today, it is a man’s ribbon, a symbol to spark conversation and help change the face of men’s health. You can take part either by growing one Dirty Son of a Mo as a Mo Bro, or join as a Mo Sista to help recruit others, share knowledge and support Mo growers. 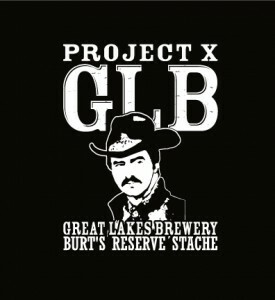 Join the Great Lakes Brewery Movember team today!! Also, please come out to our Movember party being hosted by Wvrst Beer Hall on Nov 8th from 6:30pm -9:30pm. Great Lakes will be doing a 12 tap take over for the evening featuring limited release Movember beers. Limited amounts of our Movember series beers will also be available in bottles at our retail store through the month of Movember. Proceeds from the bottles sales will be donated to Movember. Please join and forward this message on to EVERYBODY you know! It was another great year for brewing in BC. This year our brewers managed to take home 1/3 of the Canadian Brewing Awards! Fat Tug IPA, Driftwood Brewing Co.
High County Kolsch, Mt. Begbie Brewing Co.
Belgian Wit, Granville Island Brewing Co.
Hill’s Special Wheat, Yaletown Brewing Co.
Thor’s Hammer, Central City Brewing Co.
Sap Sucker Maple Porter, Fernie Brewing Co.
Serendipity #3, Tree Brewing Co.
Navigator Doppelbock, Lighthouse Brewing Co. Harvest Moon Organic Hemp Ale, Nelson Brewing Co.
Baldwin and Cooper Best Bitter, Howe Sound Brewing Co.
Diamond Head Oatmeal Stout, Howe Sound Brewing Co.
Hoppelganger IPA, R&B Brewing Co.
Red Racer Imperial, Central City Brewing Co.
Cypress Honey Lager, Granville Island Brewing Co.
Pumpkineater Imperial Pumpkin Ale, Howe Sound Brewing Co.
Singularity Russian Imperial Stout, Driftwood Brewing Co.
Yaletown Oud Bruin, Yaletown Brewing Co.
Megadestroyer Imperial Licorice Stout, Howe Sound Brewing Co. Overboard Imperial Pilsner, Lighthouse Brewing Co.
Thirsty Beaver Amber Ale, Tree Brewing Co.
Captivator Doppelbock, Tree Brewing Co.
Howe Sound Lager, Howe Sound Brewing Co.
Analog 78, Phillips Brewing Co.
Garibaldi Honey Pale Ale, Howe Sound Brewing Co.
East Side Bitter, R&B Brewing Co.
Woolly Bugger, Howe Sound Brewing Co. Hop Head Double IPA, Tree Brewing Co.
Yeah, I know the Reader’s Choice Awards are a bit of a popularity contest, but consider the U.S. population in the Pacific Northwest… now consider some of the brews in that region. BC took BEST IPA and Barleywine! Clearly the people of British Columbia are impressed by their brewers! If you’ve been following the monthly BC Beer Releases here, you’ll know there’s been a heck of a lot this year. The craft beer industry is certainly healthy in BC. A number of Brewers are expanding distribution into Ontario, and there’s continued growth here as well. In 2012 we’ll finally see the new production facility for Central City Brewing, along with at least 4 brand new starts: Townsite Brewing in Powell River, Firehall Brewery in Oliver, Hoyne Brewing in Victoria, and Parallel 49, which is affiliated with St. Augustines in Vancouver. Lighthouse Brewing will be releasing the fourth beer of their “Big Flavour” series on April 29th. Personally, I can’t wait. But if that seems a little ‘big’ for your palate, they’re also releasing their summer mix pack, with a new Cream Ale inside! 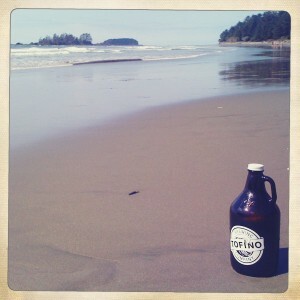 Tofino Brewing Company is now open for business. You just can’t get more west coast… and while I haven’t made it out, here’s one more reason to make the trip. Last year, just in time for Remembrance Day, they released Boomer’s Canadian Red Ale, which was named in honour of Andrew “Boomer” Eykelenboom, a Canadian Armed Forces Medic who was killed in Afghanistan. Proceeds went to the Boomers Legacy Fund. Now they’re teaming up with the Canadian Parks and Wilderness Society and launching “Beer for Animals”. Rockfish Red Ale is brewed with Chinook, Cascade & Mt. Hood hops, with Roasted Barley, Munich, Caramalt and Chocolate malts. It will be available in March and $1 from every bottle will go to CPAWS habitat conservation. Phillips Hops into the (Chinese) New Year! It’s the year of the Rabbit and there’s certainly good things hopping at the Phillips Brewing Company! 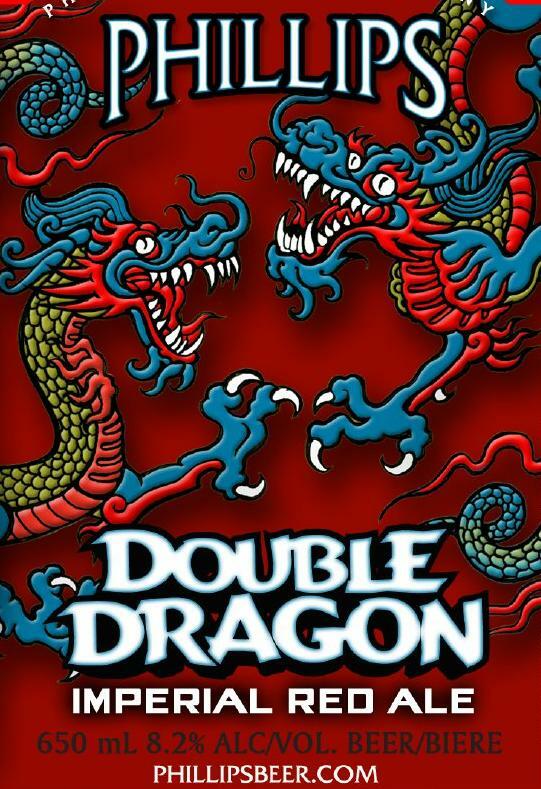 In addition to releasing the Double Dragon Imperial Red Ale, they’re replacing the Surly Blonde with Hoperation Triple Cross Belgian IPA. And as if that’s not enough for the hop heads, they’re introducing a Hop Box Showcase (12 pack), which includes Hop Circle IPA, Skookum, Krypton Rye PA and a revolving specialty that will start with the Centennial IPA (a new single-hopped IPA in their GrowHop Series)! If hops aren’t your thing, they’re also releasing bombers of their Ginger Ale, which would probably pair really well with Chinese food.